Use the hole cutter to drill a hole 1.5 inches from the bottom of the bucket (you can do this by hand). Screw the connector, hose and filter onto the bucket. Fill the bucket with water from any source, lower the filter head below the water line, and let gravity do the rest. 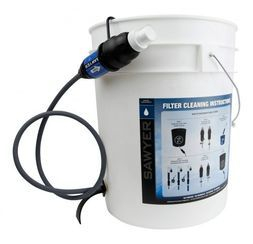 Just 4-inches long and less than 8 ounces, the Sawyer PointONE can deliver 1 liter of clean water in 60 seconds. The Sawyer PointONE is a POINT-OF-USE SYSTEM. Since there is such a high flow rate, it eliminates the need to store water which reduces the chances of water being contaminated after it’s filtered. The only external force required for the system to function is gravity. The Mini weighs just 2 ounces and filters up to 100,000 gallons! What’s special about Sawyer filters is they filter to 0.1 micron, exceeding EPA and NSF recommendations. You can drink directly from the Mini, attach it to Sawyer Squeeze Pouches, use inline on a hydration pack, or attach it to the top of almost any bottled water. How about that for versatility? And like all Sawyer Filters; they are backflushable almost indefinitely. That means no expensive cartridges to replace, ever.